Inspired by the young Steve Jobs, I recently put OperationalCloning to the test by modelling Dell Inc’s large global network and examining the impact of change on it. I did it in two days. Back in 1980, an interviewer asked Jobs why personal computers were so successful. He said that in addition to becoming more mobile and affordable, PCs amplify an individual’s inherent ability, giving them the power to do much more with what they already know. I realized that this is exactly what we set out to achieve with OperationalCloning: putting large, complex supply chain and logistics change projects within reach of individuals and smaller working groups by giving them the power to know the network and to design change in a way they couldn’t before. Dell as a natural choice for this test simulation Dell is famous for its configure-to-order approach that relies on air freight to maintain competitive service levels. Configure-to-order is highly sensitive to the volatility of fuel prices and product prices – something that Dell has seen plenty of in recent yearsi. 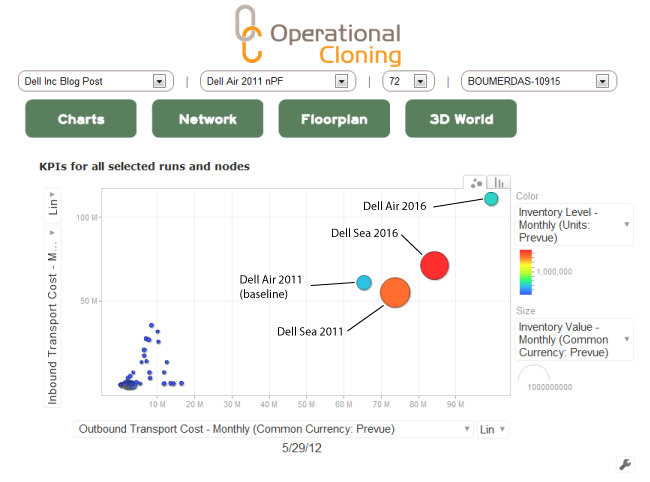 I decided to quickly model Dell’s global network and look at the sensitivity of its supply chain to these changes using OperationalCloning. Dell’s supply chain costs (expressed as a percentage of revenue) will increase — “Sweet spots” in terms of the average value density of a product range in relation to external cost factors do exist in time (or it is possible to get lucky). Put another way, it is likely that Dell’s total supply chain cost expressed as a percentage of revenue will increase regardless of the preventative steps it takes. The tipping point that forces a complete shift from configure-to-order is years away — The tipping point where a significant shift away from configure-to-order is mandated by external factors is potentially years away and will most likely only apply to lower cost product families and servicing non-domestic markets (assuming that US domestic manufacturing remains as is). Inventory carry cost will remain dominant – When considering supply chain design changes, the dominant factors are still inventory carry cost and how the US domestic market is serviced. In addition, inventory carry cost is very sensitive to the average planning and purchasing frequency that results due to the planning strategy implemented. You can explore the simulation results on Google Public Data Explorer. In the meantime, read on to learn how the OperationalCloning test simulation was done. The first step is to create an approximation of Dell’s DNA. I gather all the information I need from Dell’s 2011 Annual Report and a brief tour of the Dell Inc website. Using the OC DNA generation function from our consulting toolkit, I directly input the Dell information. See The Dell Inc Summary Details Used to Compile the DNA, at the end of this post. I enter the summary details and start the baseline DNA generation process running. It will take 5 hours and 35 minutes, so while it runs, I start thinking about the change scenarios. I know that the average annual downward trend of Dell’s product is 5%. To find the annual trend for oil prices, I take the average inflation adjusted crude oil prices for the last ten years – an average annual increase of about 5%. I decide to use the baseline DNA (in other words, all air freight) and extrapolate five years out to 2016. I compare that with a scenario using mostly sea freight with make-to-stock and an average planning cycle of 28 days. In the baseline scenario, the DNA generation process tries to find distribution centres as close as possible to the geographic demand it serves. In the sea freight scenario, the DNA process prefers port locations. Dell is closing the Lodz facility, so I remove it as a point of supply (for the purpose of this test case I keep revenue constant). I vary the summary DNA data according to the change scenarios identified, and start their generation process. When it finishes, I check the SKU related DNA data and notice that I forgot to change the purchasing/planning cycle to 28 days for the make-to-stock scenario. I change the summary data and regenerate the DNA data for the alternate scenarios. With the DNA versions correctly generated I upload the DNA files, which takes 35 minutes. As I am only interested in approximate network metrics for this test case, I start Prevues. I log in to check results and use a bubble chart to plot inbound transport, outbound transport and inventory value for each clone (see below). This gives me a sense of how the scenarios compare. The totals for the four clones stand out in the top right corner and visually align with my intuition. Next I download the results into Excel and copy the totals for the chosen KPIs. To compare one scenario with another, I add the transportation costs and the estimated inventory carry costs (using 18% of inventory value), and divide it by the total revenue for the scenario. while an “all or nothing” approach to choosing an inbound mode of transport and inventory planning strategy is a simplification, it helps with understanding the trade-offs in the approaches and its impact on designing the network. Looking through the results, I spot a mistake – the purchasing/planning cycle frequencies again. I forgot to re-align the purchasing frequencies for the network nodes to the replenishment lead-times after I generated the DNA for the different scenarios. I fix the DNA for the different scenarios and re-do the uploads. Time to kick off the new Prevues. OC reports that the clones have been rolled up. I log in and look at the bubble chart, and I summarise the results as before. I pour a cup of coffee and begin reviewing results and creating the preliminary observations about Dell’s finished goods supply chain set out at the beginning of this post. i The downward trend of PC prices has continued since Steve Jobs turned them into a mainstream commodity, with prices declining an average of 5% per year. In recent years, this downward trend has been more volatile. In the last quarter of 2008, selling prices dropped about 14%. In November 2010, the average US selling price increased by 6% from the previous year. Revenue Headquartered in Round Rock, Texas, Dell Inc’s 2011 revenue was $50,002 million. To simplify things I ignored software and peripherals reported at $10,261 million, reducing the 2011 revenue to $39,741 million. 52% of the revenue is domestic. Distribution Dell distributes to 180 countries, which I reduced to 160 for this test simulation. I guessed that Dell distributes from about 45 countries. Product families I collapsed the Dell product families to: (i) servers and networking; (ii) storage; (iii) mobility; and (iv) desktop PCs. I estimated the total number of SKUs in these product families at about 650. SKU parameters I assumed Average purchase price across product families: $915 with a minimum to maximum range of $250 to $60,000.Average unit weight across product families: 4 kg with a minimum to maximum range of 1.8 to 40 kg.Average unit volume across product families: 6000 cm3 with a minimum to maximum range of 2000 cm3 to 70,000 cm3. The average gross margin across product families: 0.14 with a minimum to maximum range of 0.06 to 0.30. Average order value I assumed an average order value across the network as $1,400. Revenue groupings and order profile Dell reports segment revenue by grouping large enterprise, public, small and medium business and consumer. For this test simulation I grouped the large enterprise and public as order class A, small and medium business as order class B and consumer as class C. Given this grouping, the order class demand proportions for A, B and C are 56, 24 and 20 percent. Order class A subclass demand proportions are 51 and 49 percent, with the average lines ordered per subclass 6 and 15. Order class B subclass demand proportions are 50, 35 and 15 with the average lines ordered per subclass 14, 10 and 5. Order class C subclass demand proportions are a 100 percent with the average lines ordered per subclass 2. Primary points of supply Given the scope of this test simulation, Dell has 6 primary points of supply located in North America, South East Asia, East Asia, South America, South Asia and Eastern Europe. Forget about Big Data. Start by knowing your DNA.